Buzz-word phrases like Carbon Capture and Storage, its sister concept Carbon Capture and Utilization, Enhanced Oil Recovery, and “Clean Coal” have been gaining air time in conversations among oil industry experts and policymakers. Stillwater has done work in the CCU space. In fact, Stillwater Energy Group – a subsidiary of Stillwater Associates – has a related patent. We are excited to see industry interest building around this concept, and after learning more about the current CCU and EOR landscapes at CERA Week, we thought we’d offer a quick update. Let’s start with the basics – the differences between CCS and CCU. Carbon Capture and Storage (CCS) is a category of projects that capture carbon dioxide (CO2) emissions produced when fossil fuels are burned to generate electricity or for other industrial processes and then store the captured CO2 in the ground, traditionally in a saline formation. The intent of CCS is for this carbon to remain sequestered more-or-less indefinitely. Through what is known as the 45Q tax credit, the federal government now offers a $20/ton tax credit for CO2 that is properly sequestered (pre-planned inflation adjustments eventually raise this credit to $50/ton); few other entities in the market will pay for this. Carbon Capture and Utilization (CCU) projects capture and then use CO2 emissions rather than simply sequestering them. Some CCU methods delay the carbon from entering the atmosphere while reducing the consumption of the original feedstock. Enhanced oil or gas recovery (EOR, EGR) and CO2 mineralization, result in essentially permanent storage. In other utilization cases, the captured CO2 is emitted later in the product chain when the CO2-based product is consumed. 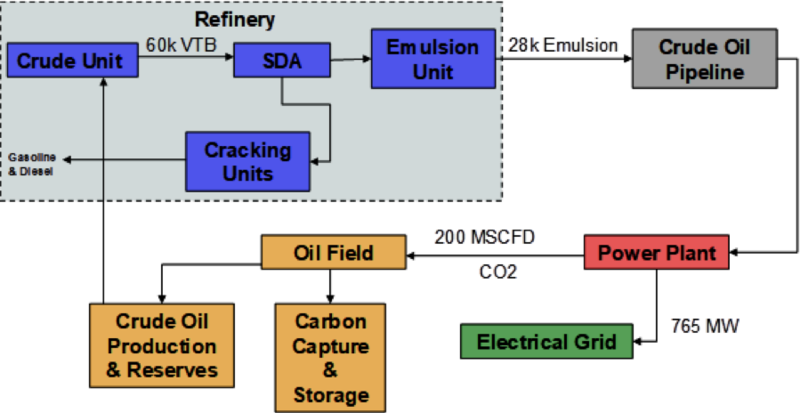 Enhanced Oil Recovery (EOR) is one form of carbon utilization. For certain oil formations – generally light oils – pumping CO2 into the formation will help dissolve the oil, making it available for recovery. Traditional oil fields can typically recover 50-70% of the oil in the fields without EOR, but EOR increases that efficiency significantly. For those looking to invest in carbon capture projects, EOR is more enticing than sequestration because CO2 used for EOR has value – oil producers are willing to pay for it because it improves their bottom line. Through the 45Q credit, the federal government also offers a $10/ton tax credit for CO2 that is re-utilized as in EOR (this is slated to rise to $35/ton). At CERA Week, we learned from Steve Winberg, the U.S. Department of Energy’s (DOE) Assistant Secretary for Fossil Energy, that his department is active in CCU research. With an aging coal fleet, and a federal administration with an energy strategy which includes coal, Winberg is looking at next-generation coal plants which would likely include CCU. Stillwater Energy Group proposed a project like this years ago with BP. The idea was to build a coke-burning power plant which treated emissions, cleaned the stack gas, then used those emissions for EOR. People living nearby, however, expressed concerns about CO2 containment in EOR projects near population centers. One way to address that concern was to send the CO2 to remote California oil fields with light, deep reserves which are well-suited to EOR. The challenge was in getting the carbon from the capturing location (the refinery or power plant) to the oil field since there are no existing CO2 pipelines. At CERA Week, we learned that Occidental Petroleum Corporation, the company with the largest EOR operations in the U.S., is looking for help in building a very pricey pipeline from the U.S. Gulf Coast to address exactly this issue. Winberg also confirms that his department at DOE is doing early-stage pipeline research. Stillwater Energy Group came up with a solution for this problem years ago when we realized the carbon is created in the refinery but needed in an out-of-town oil field. We patented a way to convert “bottom of the barrel” products into an emulsion (like Orimulsion) that can be transported like oil through an existing pipeline. Then, the idea was to build the emulsion power plant at the oil field rather than at the oil refinery. This arrangement of resources solves the transportation problem since the CO2 would be captured right onsite where it was to be utilized for EOR. Economic challenges kept this project from getting off the ground, but those economics are changing as federal and state policies around CCU and CCS evolve, carbon market credit prices rise, and interest in this type of project grows. We at Stillwater Associates remain interested in this field of research, study, and exploration. If you have a project in this space with which you need help, we would be happy to discuss it with you and help however we can. Contact us!